It is often hard to describe the intricate relationships between animals and their humans. 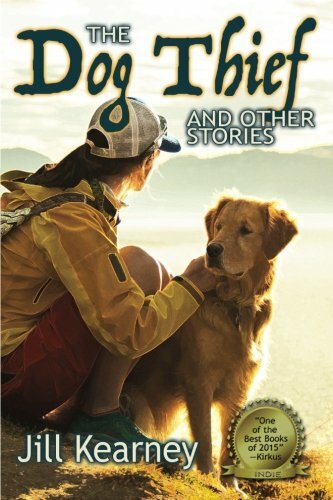 In her book, “The Dog Thief: And Other Stories,” Jill Kearney has no such issue, delivering a poignant collection of short stories that pull at your heartstrings, leaving imprints not likely to fade when the reading is finished. Inspired by her own experiences working as a care provider and dog rescuer, Kearney spins the narratives of people forgotten or displaced by society, and the animals that place their trust in them. In her own words, “I’m interested in the lives of people who feel like they don’t matter to anyone.” This statement truly echoes throughout the book. The collection begins with the self-titled novella, The Dog Thief, in which neighbors of a downtrodden community band together to rescue a couple of dogs from their neglectful owner. Donald, the owner of the dogs, actually inherits the dogs upon the death of his mother and then later, his sister. Donald is lazy and neglectful toward the dogs, yet one gets the impression he feels duty-bound to keep them. His protectiveness of the dogs however belies any regard he has toward their well-being, placing his mental capacity into question, at least for this reader. The author also weaves riveting subplots into the story as we follow Donald’s neighbors in their efforts to help. Dealing with the injustices and the confines of their environment, Elizabeth, Blacksnake, The One-Eyed Woman, and others provide intriguing viewpoints of the complex issues they encounter as they learn first-hand how seemingly insignificant acts can make a difference in the world. The short stories that follow the novella are just as captivating, each one striking a chord within, causing a need to stop for contemplation before moving onto the next. I was so drawn by some of the characters and the ways I could feel what they were feeling and going through, I actually read several of the stories twice. Kearney’s writing is passionate, straightforward and direct. Foregoing the need to placate the reader with sugar-coated narrative, her voice and certain outspoken nature tells it like it is, with a wit and freshness that is as charming and endearing as it is haunting and discomforting. Seriously, there is no way one can help but be moved by these stories. Some of the most paltry surroundings, places I could never have imagined, became clear and distinct in my mind through the vivid and rich descriptions presented by the author. Heartbreak, helplessness, hope, and inspiration – these words only hint at the range of sensations readers will feel in these pages. “The Dog Thief: And Other Stories,” by Jill Kearney is a book I highly recommend. Pet and human advocates will be hard pressed to put this book down as Kearney provides an insightful look into what truly matters.